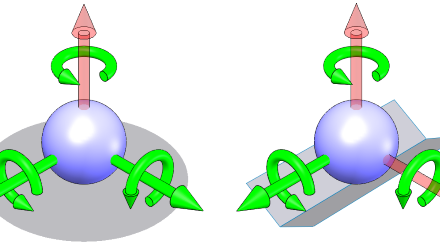 Kinematic components are the set of balls, vees, and other shapes that come into point contact with each other to locate the structural members of a kinematic mount relative to one another. 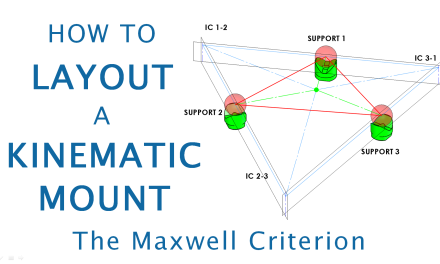 In this article, we discuss the desirable material properties of kinematic components and the criteria used to evaluate materials for your kinematic mount design. We also provide a quick reference sheet for comparing the relevant properties of common kinematic component materials to help you select the right material for your design. The point contact between kinematic components results in high Hertzian contact stress under even moderate loads, which can compromise the performance or limit the life of a kinematic mount or coupling. The minute deflection of the surfaces under that load is a measure of the stiffness of the joint, which affects accuracy, especially under variable loads. These local deformations also resist the tendency of the components to settle into their ideal position, so smaller is better. And the integrity and accuracy of that interface can be compromised due to corrosion; wear; or micro-yielding under the influence of environmental effects and operating loads including humidity, temperature change, shock, vibration, and disassembly/reassembly. Given these concerns, ideal materials for kinematic contacts are hard, stiff, high strength, and corrosion resistant. Mating contact materials must also be compatible to avoid problems with galvanic corrosion, galling, or excessive friction. Whether a given material is suitable for a specific application depends not only on the properties of the material but also on the geometry; operating and environmental loads; and performance requirements of the system. These criteria and their applicability to certain designs are discussed below. Table X summarizes them. Commercial, off-the-shelf kinematic components are available in each of these materials. And custom parts can be fabricated from them as well (even tungsten carbide and sapphire) as described below in Machinability and Fabrication. This is not an exhaustive list; other materials may be suitable for your application, as well. You can use the table as a reference for evaluating alternative materials. If you know a material that you think should be included in the table, please let us know via the contact form. Wait… what is aluminum doing here?! The table also includes entries for 6061-T6 aluminum, phosphor bronze, 303 stainless steel, and 304 stainless steel, which are not recommended for use as kinematic components. So why are they included? For comparison – Ideal kinematic component materials are described as hard and strong. Contrasting them with poor choices helps to define those attributes. For convenience – These softer materials are often used in conjunction with kinematic components to create structural members, threaded bushings, and other parts of a kinematic mount. It can be helpful to see properties for all of them in one place. For edge cases – Despite their drawbacks, sometimes the available space claim or some other constraint dictates that they be used as kinematic components, often combining features such as a v-groove in the structural component. It is impossible to discuss the suitability of a material for use as a kinematic components without mentioning Hertzian contact and Hertzian contact stress, since they directly relate to the performance and life of the mount. But these are complex topics deserving of their in-depth own article. For the sake of this article on material selection, contact area, deflection, and stress and their relationship to material properties will be discussed only qualitatively, not quantitatively or analytically. A future article will expand on them. Material properties and thermal properties in particular tend to vary with temperature, so the operating temperature range as well as the temperature at which the system is built and aligned must be considered when selecting materials. The materials are listed in terms of increasing hardness. Hardness is a measure of the resistance of a material to local deformation under a defined load applied by a small shape called an indenter; harder is better. This is highly relevant for kinematic components, since deformation under point contact is proportional to contact stress and also resists free motion between the kinematic components. Hardness is often related to the yield strength of the material. And for some materials, it can be purposefully modified by manufacturing processes. This ability to be hardened is the reason that 440C stainless steel is a good choice for a kinematic component but 303 stainless steel is not. Hardness is determined experimentally using different loads and indenter shapes. Hardness varies so widely among materials that a single test method and scale cannot cover them all. The table presents presents hardness using overlapping Rockwell B, Rockwell C, and Knoop scales to give some sense of the range from softest to hardest. For a given material, bold face indicates a value that was experimentally determined. Other values are approximate conversions for comparison purposes only. Unlike hardness, which can sometimes be manipulated and is related to strength, modulus of elasticity is an intrinsic property of the material related to stiffness. In general, it does not vary with manufacturing process. It’s the ratio of the longitudinal stress to the corresponding strain in the elastic regime; it has the same units as stress. The higher the modulus of elasticity, the stiffer the material. The point contact between kinematic components is only a point when considered at a large scale. 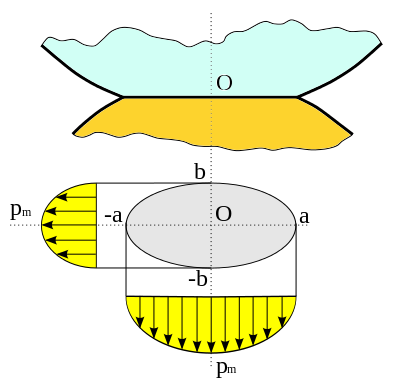 In practice, it produces an elliptical contact area with the amount of deflection varying from a maximum at the center of the ellipse to zero at the perimeter, as shown in the image from Wikipedia below. The amount of deflection varies in each component and depends on the modulus of elasticity (E) and Poisson’s ratio (ν) of each material, as well as the shape of the parts and the applied load. For a given load, the amount of deflection along the line connecting the centers of curvature of the parts is a measure of the normal stiffness of the joint. Contact area and deflection relate to the Hertzian contact stress, which can cause failure, as is discussed in the next section. The deformation creates a resistance to motion that can be thought of like a flat tire. It resists the tendency of the contacts to assume their “ideal” relative position on initial assembly or to return to that position after being moved or separated, such as under the effects of thermal expansion or vibration. 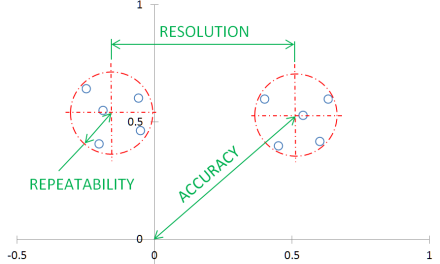 This reduces the repeatability of the mount, which limits the accuracy. If the load carried by a kinematic mount is variable, the position and orientation of the mount will vary as a function of the stiffness. So a stiffer joint results in greater consistency for a range of loads. This affects the accuracy of the mount. The stiffness of the joint contributes to the overall stiffness of the system and therefore its natural frequency. Ductile materials will fail by yielding where the shear stress is maximum at a point below the surface. For ductile materials, the shear strength can be approximated as 57.7% of the yield strength. Brittle materials will fail by fracture where the tensile stress is maximum, at the edge of the ellipse. The ultimate compressive strength is the relevant material property in this case. As indicated in the table, recommended materials for kinematic components are considered brittle. You will want to apply an appropriate factor of safety that takes into consideration the usual uncertainties in calculations, material properties, and operating conditions as well as the consequences of failure. Kinematic components that also play a structural role – such as a single piece of 440C stainless steel with three v-grooves forming one half of a Maxwell-style kinematic mount – may also warrant higher than normal factors of safety. For many metals, the yield strength is defined as the point at which 0.2% plastic strain occurs. That is a deformation of .05 mm over a distance of only 25 mm, which is unacceptable for precision applications. Alternatively, the micro-yield strength (MYS) of the material can be used, if known. Micro-yield strength is defined as the stress that causes a permanent strain of 1 part in 1 million. Fortunately, the relationship between yield and micro-yield strength is not linear, otherwise 6061-T6 aluminum, with a yield strength of 276 MPA, would have a micro-yield strength of only 138 kPa. In actuality, the micro-yield strength of 6061-T6 aluminum is 69 MPa. Values for micro-yield strength are not readily available for many materials. However, for closely related materials, MYS tends to be proportional to yield strength. This category of properties primarily relates to materials that are used for structural components. They are included here primarily for completeness, although kinematic components may sometimes play a dual role as a structural member as described above. These properties will be discussed in depth in an article on selecting materials for structural members in precision applications. But of particular interest – especially when distinguishing between strong and stiff materials – is the specific stiffness. When a mount is subject to a significant or significantly varying external load, high modulus of elasticity (E) materials such as steel will minimize the deflection or the change in deflection under load. It is surprisingly consistent for many materials. For example, steel, aluminum, magnesium, and glass all have a specific stiffness in the range of 25-28 x 106 m2/s2 while brass and cast-iron have a value in the range of 13-14. But some exotic materials have exceptional values: tungsten carbide has a value of 42.7, sapphire of 109.6, silicon carbide of 140, and beryllium of 155. Similarly, thermal distortion figures of merit – thermal diffusivity, steady state distortion coefficient, and transient distortion coefficient – are included for completeness and convenience, but they will be discussed in depth in another article. Corrosion resistance cannot be quantified in single word or phrase. Whether parts will fair well over time depends on the material, finish applied, mating materials, the operating environment, and sometimes even residual effects of producing the parts. The ratings given in the table are only the most general guidelines based on performance of a material under common conditions in comparison to similar materials. You must consult with material vendors and research your own application to determine if a given material is suitable. Simply captured by the preload within mating features. Precision balls are readily available in a wide range of materials and sizes, including exotic and difficult to machine ones. Commercial, off-the-shelf flats, vees, cylinders, and sockets are also available but in a smaller variety of sizes and materials. So when a material combination involving one of these is needed, especially when space is constrained, it may be more practical to purchase a ball made of the exotic material and make the mating components out of easier to machine metals. When a complex shape such as a single part with three radial v-grooves is needed but the space claim or other constraint prevents the use of inserts, the part may need to be machined from whole (e.g., rod or billet) or from a near net shape (e.g., a casting or weldment). Traditional machining becomes significantly more difficult, time consuming, and expensive – if not impossible – in the hardened state. Surfaces can be ground, honed, or lapped. Techniques such as electrical discharge machining (EDM) can be used to to modify electrically conductive materials such as 440C, tool steel, and tungsten carbide. EDM even enables features that are difficult or impossible to create using other material removal processes such as milling or turning. 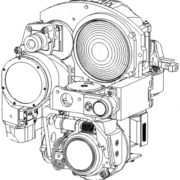 EDM only removes material, but features can added as well by first machining a hole or other feature into which another part is pressed, bonded, or fastened. Sapphire can be machined, as demonstrated by its use in jewel bearings, which are available as conical detents and in other forms that lend themselves to kinematic mounts. When used as an optical component, sapphire may be machined to produce complex edge profiles; add bevels or rounds; and even form curved surfaces. Given the expertise and access to material needed to produce sapphire parts, if you need a custom sapphire component, you will likely need to work with a vendor that specializes in it. The possibilities for complex sapphire parts may surprise you, such as the externally threaded sapphire parts from Rayotek shown on this page: https://rayotek.com/glass_custom_dome_tube_rod_prism.htm. Even more so than with sapphire, if you need a custom tungsten carbide part, you will need to work with a specialty vendor. Tugsten carbide can be produced in near net shape and readily machined before sintering, which produces its final, hardened state. In the hardened state, it can be ground or machined via EDM, thanks to its electrical conductivity. Various techniques can also be used to join tungsten carbide to other materials. If a kinematic component (or a structural member) is attracted to magnets, they can be used to apply a preload inline or nearly inline with the contact points, minimizing distortion. In addition, magnetic preload is consistent between assemblies and disassebmlies, without the hysteresis or variability of various mechanical locking techniques. In applications in which temperature control is critical, this technique can also be used to thermally isolate parts by minimizing the number of thermal conduction paths. Ferromagnetic – Not only are these materials strongly attracted to magnets, they can become magnetized themselves. Strongly attracted, attracted, or slightly attracted to magnets. Sometimes described as strongly magnetic, magnetic, or slightly magnetic. Non-magnetic – Not attracted to magnets. Austenetic stainless steels (e.g., 303 and 304 stainless) are non-magnetic but can become slightly magnetic through cold-working. Annealing can return them to their non-magnetic states. I updated the Kinematic Component Materials Quick Reference to include the material 17-4 PH H900 Stainless Steel and the properties Magnetism, Corrosion Resistance, and Machinability.